On Monday, Caesars Entertainment released the schedule for the 2011 World Series of Poker. 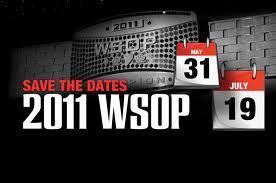 This year’s WSOP will be held from May 30th through July 19th at the Rio All-Suite Hotel and Casino in Las Vegas, NV. The number of bracelet events for this year has increased from 57 to 58. In addition, several additions and changes have been made to the event. Let’s take a look at a few of them. Event #2 this year, the $25,000 Heads-Up Championship, will replace the $25,000 Six-Handed Max event from last years. This event will kick off the open events and should provide an elite field of both live and online poker pros. In addition, this event should draw a strong spectator crowd as the only competition that day will be the Employee’s Event. The $2,500 10-Game Mix make history this year in two ways. First, it will be the first 10-Game mixed event in the history of the World Series of Poker. In addition, this 10-Game mix will include Badugi. This will be the first time that Badugi will be spread in tournament form at the WSOP. Other games in this event will include the games of HORSE, NL 2-7 Single Draw, Limit 2-7 Triple Draw, NL Hold’em, and PL Omaha. The 10-Game mix was initially conceived by Full Tilt poker, a site that allows many different US poker deposit methods. Jack Effel prides himself in expanding the WSOP in new areas, and this is just one example. Event #35 will be the first ever six-handed Pot-Limit Omaha tournament offered in WSOP history. The $5,000 buy-in event should draw a superstar field and provide some of the best action of the WSOP. Also, the Omaha 8/Stud 8 event will make a return to the WSOP schedule. This popular event was omitted from the schedule last year, and many pros and split pot enthusiasts let WSOP official know of their displeasure. As such, the event has returned and will command a $2,500 price tag as it has in the past. The one thing that fans can count on at this years WSOP is that the max they will play in any day is 10 levels. This decision was reached in order to allow players the opportunity to complete any day by 3 a.m. in order to receive adequate rest for the next day. This rule will also apply to final table days. If the final table does not reach completion after 10 levels of play, players will return the next day at 3 p.m. to play for the bracelet. This new rule should even the playing field a bit for the older players that may have a harder time playing 12 to 16 hours per day. If we see an increase in older pro players winning events, this will probably be the first reason that analysts point to. A complete schedule of events can be found at www.wsop.com/2011. You can also find information on non-bracelet tournaments, satellites, and even hotel accommodations. Structures will be posted later in the month as tournament officials are still finalizing them. The 2011 WSOP looks to be one of the best in recent memory. Pre-registration for events starts February 11th. This entry was posted on Tuesday, January 25th, 2011 at 5:24 pm and is filed under Poker News. You can follow any responses to this entry through the RSS 2.0 feed. You can leave a response, or trackback from your own site.